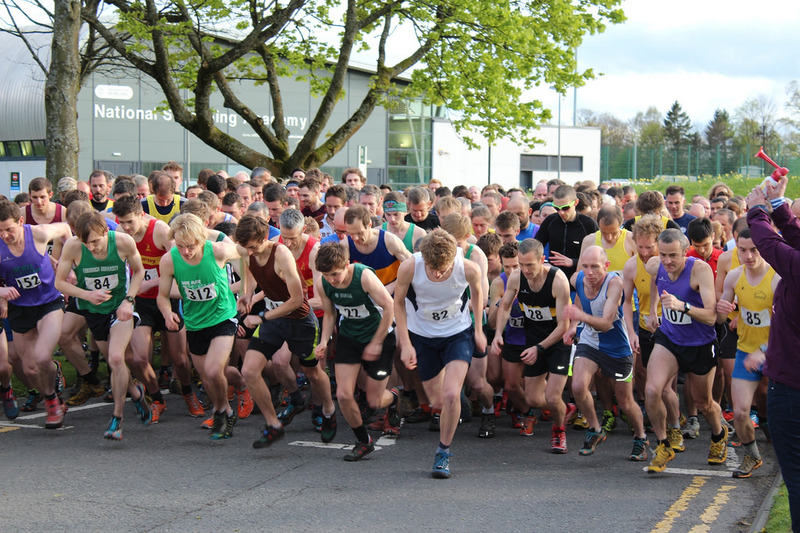 Last night was the Dumyat hill race organised by Stirling University and part of the Bog and Burn series of races. Dumyat is a comparatively small hill at the western end of the Ochil hills just outside Stirling and tops out at 390m. The course is a straight up and down starting from the university campus. It begins on a tarmac road which you soon turn off and up through a steep wooded section, over a burn, more woods with a short, near vertical mud wall to clamber up, then you are out on the long open slope to the summit with a few rocky sections to contend with. Just before the summit is a wire fence to deal with and a knee deep bog on the other side waiting to trap tired legs. Then you get to do it all again in reverse on the way down at high speed! I started out towards the front of the pack at the start line, letting the feather weight racing types dash off from the gun. We streamed up the road and through a hole in the wall to a dirt track heading through the woods. I spot Judy from the Falkland Trail Runners in the same pack as me and I know she is a really strong runner so I stuck with her almost all the way up the hill, she eventually pulled away from me about three quarters of the way up. 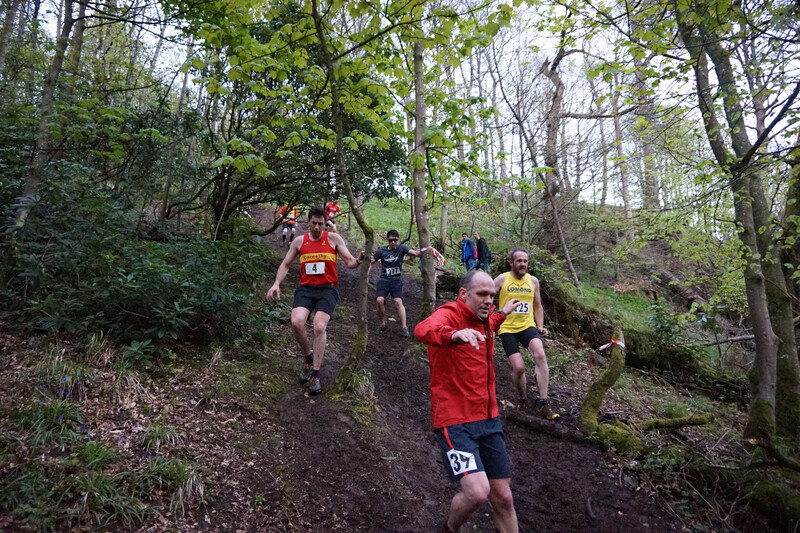 As the hilly section starts proper in the woods, there is a stretch which is particularly steep with bared tree roots and soft, slippery mud inbetween. The race attracts the usual hill running crowd but also a lot of students. There were plenty of shrieks and screams as road shoes lost their grip on this section and bodies were flying all around me. The woods eventually open out to stile and after that it is a long steady drag to the summit. It is good hill running trail all the way up for the most part with a mixture of beaten tracks, boggy bits and rocky sections. Dave from the Lomies caught me up as we were going up this and pointed out that it is one of those hills that is just about runnable the whole distance, which means you are knackered by the top! About 500yrds from the summit the front runners started to hurtle past us on their descent. It was my first race where I’d been in this situation, other races were on circular routes so I’d never got to see the fast guys. They plummet down the hill and it is a spectacle to see. If you’ve seen these sci-fi films where they are out in space and then all of a sudden asteroids start flying past, it’s a bit like that. the long, slow plod of the up hill runners contrasts dramatically with the speed and recklessness of the down hillers. The summit eventually comes up, I don’t remember much about it other than a cairn and a trig point. I didn’t stop to take in the view but I imagine it was pretty fantastic as the weather had cleared by now and the earlier rain clouds had moved on. I set off down the descent which is the bit I always enjoy. I left the group I’d been running up with almost immediately as I picked up some speed. It is a great course for a fast descent. Before I knew it I was at the bog again and doing my own asteroid impression as I flew past those further back in the field. By the time I reached the woods I’d made up about 10 places and had a group of another 5 in sight ahead of me. My legs were feeling strong by now, my breathing had settled down after the excess of the uphill slog and I was enjoying it. The ground was soft and I had my Inov-8 Mudclaws on so the slippery mud in places was my friend. After crossing the stile I remembered the really steep muddy bit and realised it was coming up again soon. I quickly discovered it along with about 8 people trying to slip and pick their way down it. I figured I had nothing to lose so decided to go for the bold approach and ran right down it, passing a huge group of people on the way. I was crapping myself that I would hit a root and make an arse of myself any second, but I managed to get away with it. All that was left then was the last bit of trail down through the woods which felt like familiar territory by now. Up a slight incline to test tired legs, through the whole in the wall and back out on to the road. By this point I was with a group of 3 other runners who I’d caught up with. We all had enough left in our legs for a fast finish and I passed over the line mid group with a time of 46m 57s. My moment of glory though was just as I crossed the finish line and I tripped on the timing mats, flying head first towards the crowd of waiting smart phone cameras. Only my ego was really damaged, but I suspect it made a few people laugh and made for a decent photo (please contact me if you have one!). Hector Haines from HBT won the race with an impressive 35m 14s. I felt fantastic at the finish, it is a great race with a great mixture of types of running. I was also happy that my legs held out after the fling. Next it is on to Ben Lomond at the weekend which I think will be much more of a challenge. UTMB 2018 – Time to train!